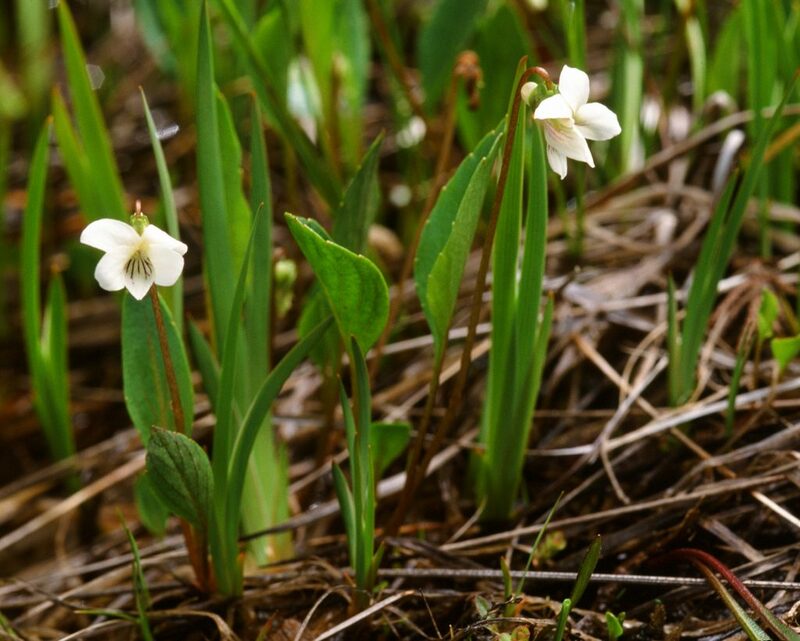 This rare wetland violet has a very limited range in the Klamath-Siskiyou mountains of northwestern California and southwestern Oregon. The characteristic leaves and limited range of V. occidentalis make it unmistakable. The stemless plants are glabrous throughout, from 8 to19 cm high, their leaves and flower peduncles standing straight upwards. The stout vertical rhizome has fibrous roots. Late in the season, the rhizome sends out many long slender stolons that root and send up new plants. Petioles are longer than the leaf blades and are often streaked with red. The leaves are shiny and thickish, to 18 cm long including petiole, elliptic to spathulate; the margin has a few crenations each with an obvious red gland in its axil, the base is tapered into the petiole, and the tip is acute or rounded. The flower peduncles are reddish, 4.0–16.5 cm long; bracteoles flare out from the middle of the peduncle, 0.2 cm long. Flowers are relatively large, white and sometimes flushed pink in the throat, some with pink guidelines on the two top petals and purple lines on the lowest three petals. The lateral petals are heavily bearded with straight, fine, relatively long hairs, the petal spur is short. Seed pods are produced from open flowers, green, elliptical, 5–8 mm long; seeds dark brown, 1.3 mm long. Viola occidentalis does not produce any cleistogamous pods, as compensation its bloom season is long, from April to September. The Kalmiopsis wilderness in the Northern Klamath Basin consists partly of peridotite and serpentine rocks that support a specialized plant community. These are tolerant of, or adapted to, the high concentrations of iron, magnesium, nickel and chromium present in the soil and that are toxic to most plants. Dwarfed incense cedar (Libocedrus decurrens) and Jeffrey Pine (Pinus jeffreyi) are indicative of this soil type. Springs and seeps are common in the serpentine areas, where the water is slightly basic (pH 8). 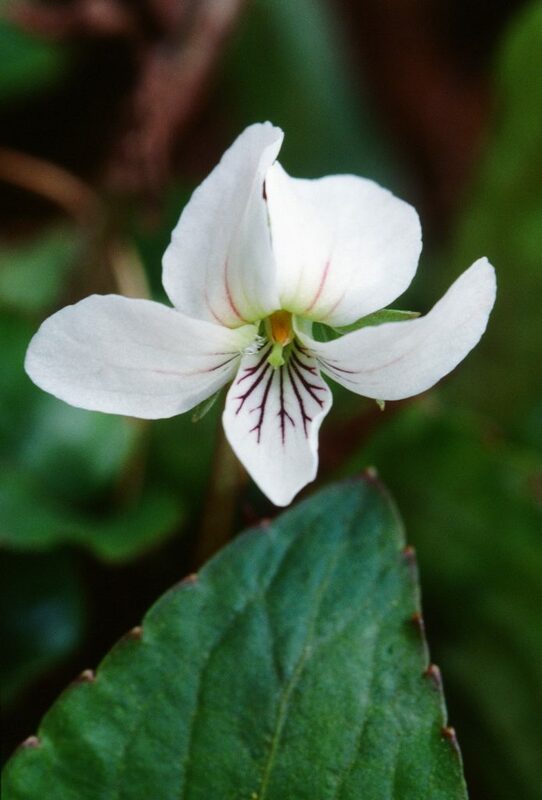 Viola occidentalis is associated with flowing water in the terraced wetlands and stream banks, open marshes and bogs, growing in sunny places, with Darlingtonia californica, Gentian setigera, Lilium pardilinum ssp. volmeri, Narthecium californicum, Pinguicula vulgaris ssp. macroceras and Rhododendron occidentale. 100-500m. First collected by Thomas Howell, 5 June, 1884 at Waldo OR. First described by Gray as V. primulifolia L. var. occidentalis Gray, Bot. Gaz. 11: 225. Nov. 1886 and Synop. Fl., p. 198. Renamed by Howell in 1987 as Viola occidentalis. Fl. N. W. Am. 69. 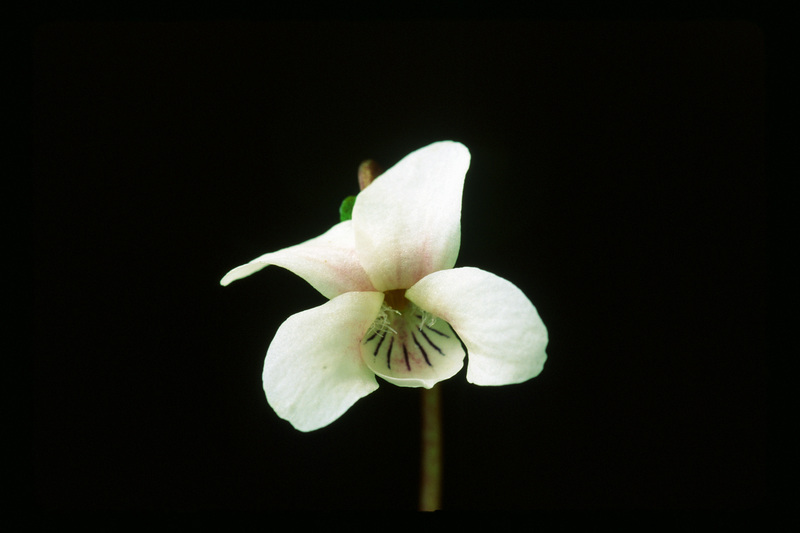 Renamed by Russell, 1955 as Viola lanceolata L. ssp. occidentalis (Gray) Russell. Amer. Midl. Naturalist 54: 485. Renamed by L.E. McKinney & R.J. Little in 1992 as Viola primulifolia L. ssp. 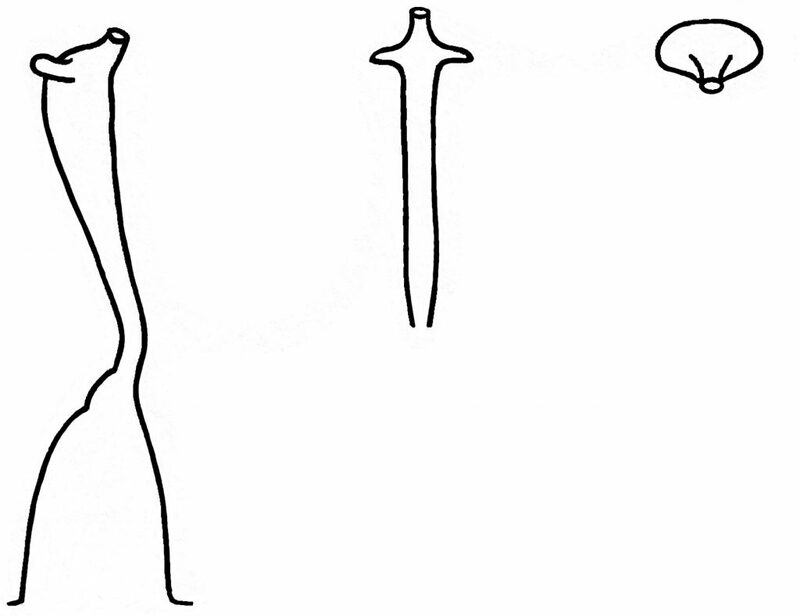 occidentalis (A.Gray) L.E. McKinney & R.J. Little. Phytologia 72: 79. Reinstated to species status as the result of chromosome analyses by Marcussen (2010) who showed that V. occidentalis is a valid species, close to, but different genetically, from V. primulifolia or V. lanceolata. Chromosome number: 2n=4x=24, where x is the base chromosome number.